a. What does one need to know? 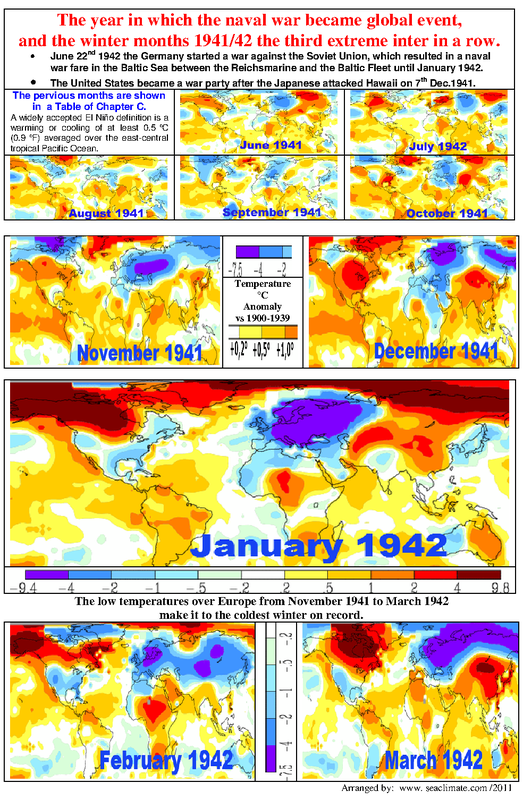 The winter 1942 was one of the coldest in Northern Europe for many decades. In The Netherlands e.g. it was the 3rd coldest on record, the further east it is more likely that it was even more exceptional. 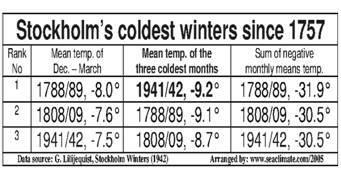 In Stockholm it was the coldest since records had been taken regularly in 1756 (Liljequist, 1942). During 1941 the war was everywhere in Europe, and went global only in the 12th month, after the attack of Japan on Pearl Harbor , December 7th. Although the naval war extended more and more into the Atlantic, war was during the first months of 1942 still mainly a regional affair, although Axis U-boats operated during that time period extremely successful along the US east coast (see: Ch.G2, p.171). As fighting took place almost everywhere in Europe and the adjacent seas, any attempt to assess a link between war activities and the course of weather within Europe or even beyond would require a different approach, hundreds of full time committed scientists, and multi million monetary resources. With the focus on Northern Europe and the Baltic region, this investigation intends to achieve a similar low budget result. Nevertheless, a brief outline of the weather situation in a few countries shall give a wider picture of the general situation, and put the subsequent detailed investigation, e.g. on Stockholm , a Cold Pool, and the sea ice in the Baltic, in a wider perspective. After a very wet start into the year in the NE district (~ 250%), the influence of northerly and north-easterly winds remained with temperatures below average (although not very markedly except for a mid-May frost) almost continuously until the third week in June, when a warm, dry, sunny period started, lasting for about four weeks. After these conditions deteriorated again, and August being wet. Conditions improved at the end of August and autumn was ‘genial’ (Gunton), whereby the notion of ‘genial autumn weather’ is an indication for continental influence, viz. higher air pressure situations than usual. · August. Quite cool and very wet. · October. The month had a very warm, fine start, with some hot days, sunshine, and fog at night. 24°C was recorded in the SE on the 1st and 2nd , and 6th and 7th. However, it became colder with showers as the winds changed to northerlies in the closing days of the month. The maximum was only 5°C in the SE on the 29th. · November. Dull and mild. · December. Generally dry and anticyclonic, and milder than average. · January. 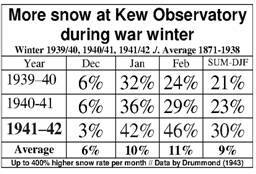 The fourth coldest January of the century - note this run of consecutive cold Januarys in the early war years. A great snowstorm across much of Britain on the 19th, causing widespread disruption. Very dull: Scarborough only had 8 hours sunshine all month. · February. Very cold (+0.1°C). · March. It was a month with some extraordinary variations in temperature. There was a maximum on the 6th of only -3°C in Birmingham . On the 8th it was -18°C at Braemar, but on the 19th it was 13°C at Croydon. On the 22nd, a maximum of 3°C was widely reported, but on the 25th, 18°C was reported at south Farnborough. There was some snow, heavy in places, in the north during the first week. It was a dull month, with only 26 hours of sunshine in the first three weeks at Ross-on-Wye. · April. A very sunny month. There was a relative humidity of only 10% at Kew on the 15th, the second lowest reading on record. Warm: the first in a run of above average Aprils that took us to 1949. The final week, from the 24th to the 30th was extremely sunny and there was no rain recorded in much of England between the April 10th and May 9th. Comment: By all means that does not sound too exceptional, although it had been one of the coldest periods for many decades. Presumably more interesting are other aspects. For example, if August had been very wet, could naval war have contributed? What the records definitely show is the frequent confrontation between maritime and continental conditions. The year 1941 it was throughout too cold and dull with high precipitation for the whole Reich (Witterungsbericht, 1948). Actually, this applied more to the southern part of Germany , with 130 to 160% more rain northwest of the river Danube (Donau), the middle part of the river Elbe and Silesia . At the same time all coastal areas had good weather with above average parameters: 85 to 95% of precipitation, less cloud cover (2-5%), less dull days (2-10 days), and up to 200 hours more sunshine. In Berlin the winter 1939/40 had been colder than the winter 1941/42. · October: The stable European weather changed suddenly when an extensive low-pressure area from the Barents Sea intensified over the Baltic on October 9th, and at the same time an Atlantic cyclone approached the German North Sea coast. Weather remained varying while a Mediterranean cyclone controlled Central Europe on October 29th. · November: Variant weather continued well into November, whereby the North Sea coast saw some warming due to a virulent cyclone off Norway (on November 5th), which could withstand the influence of an Atlantic high air pressure area. From thereon a north-easterly weather situation prevailed with interruptions. · December: December weather was too mild and, except for larger areas in south Germany , too wet. On December 3rd a warming period started in North Germany with a mix of snow and rain. The weather remained very variable, with a number of cyclones passing northerly Europe , bringing subtropical warm air, and moving the temperatures 8-10°C above average. A cold front of a South-Swedish cyclone ended the impact of the subtropical warm air, while precipitation in North Germany continued until an Atlantic high-pressure area brought clear weather. The weather changed suddenly on the 25th with the inflow of arctic cold air causing abundant snowfall with clear frost days until the end of the year, except for North Germany that experienced some moderate temperatures due to a warm front, causing thick fog. · January: At the start of the month strong frost continued east of the Wisla (Weichsel) only, while a high-pressure area over France brought mild maritime air with rain for the rest of Middle Europe, falling as snow in East Germany . With a strong rise of air pressure over the Atlantic cold arctic air flooded in, building up a high-pressure area in the North, driving cold air from Russia far to the West (January 8/9). From January 14th to the end of the month several new thrusts drove in continental air, while disturbances moved from England , via France to the Mediterranean . The temperatures dropped everywhere - except over the North Sea islands (Ostfriesischen Inseln) – to minus 20°C, followed by absolute record freezing temperatures on January 22nd - 23rd. · Februray: Was again very cold and too dry. Although the temperature did not reach the level of the previous January, it accounts still for one of the coldest observed with deviations in the north-east of minus 6 to 7°, and minus 4 to 5°C further in the west. Precipitation fell as snow, within the normal range. Comment: The situation in late 1941 and January 1942 demonstrates that the North Sea and Baltic, as in previous war winters, had been too ‘weak’ to ensure Atlantic West Wind to function over central Europe as usual, i.e. to stop the advance of continental air westwards. Particularly the shift of cyclones south of England and straight to the Mediterranean indicates that the Atlantic weather machinery was functioning. The developments since January 14th show that the Baltic suffered a ‘breakdown’, unable to emit any heat into the air that would at least have minimized the free flow of arctic air straight into Europe . The winter 1941-42 was extraordinarily long lasting and cold in spite of December having mean temperatures above normal. January and February were about 6°C colder than normal for the country. From January 7th on, a long and lasting frosty period started, and temperatures dropped to a record low of –31.0°C on January 26th. After severe cold in February, (max. - 29°C), also March and April had been cold, with considerable frost on April 4th (-17°C) and again considerable frost during April 25th to 29th. Considering the ‘amount of cold’, this winter took the first rank, whereas the winter 1939/40 only reached the second place (Det Danske, 1942). A new and comparatively hard period of frost began in the early part of December. December 20-22 weather was milder, with a variable, mostly W-wind. On December 23 frost increased and a new period of hard frost set in. Wind was weak. Hard frost set in four days later on 27th, with very hard frost in the central part of the Gulf of Finland . On the following day the weather became a little milder and it began to snow, and after a couple of days mild weather set in, i.e. in the evening of December 31, the wind shifted to South and increased to 3-5 Beaufort. On January 6 a strong outbreak of arctic air masses began to push outwards from the north southward over Finland , resulting in the formation of a ridge of stationary high air pressure over Scandinavia . By January 15 the outbreak of cold air had reached Germany , where the independent cold air pool (“Kaltlufttropfen”) was formed. Thus the period of severe frost had begun. More details in the section on sea ice and the air cold pool. · Most important, Sweden is located close to naval activities that took place in the Baltic. · Sweden ’s winter weather depends profoundly on the water conditions of the Baltic. · Sweden covers the entire north-south extent of the Baltic. 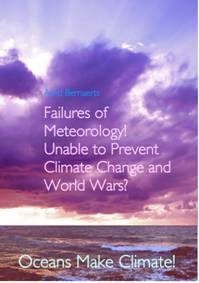 · Sweden was the only country in the Baltic region during WWII that was neither at war with anyone, nor occupied, resulting in a fairly continuously operating meteorological service, which was able to continue publishing throughout the war. · As the situation at Stockholm had been observed particularly intensive, a separate section will be dedicated to such observations, including a comparison with some other places in Sweden . All regions around the Baltic have a special story to tell why weather was out of tune during some war winters, but none has so much to offer climate researchers as Sweden does. Sweden was the only country not at war with a neighbour, and has by far the longest coastline from West to East and South to North. Also Sweden is part of the Atlantic weather system, and cyclonic activities which usually move straight from west to east, but may also arrive from the Barents Sea, or the Black Sea . Sweden was presumably one of the few countries in Europe where meteorological service and publication continued to work as before the war. From the official Swedish annual reports one can learn, that the summer was generally warm. In Stockholm the temperature had been +11.5°C above the usual mean. The highest temperature measured in Sweden in summer 1941 was 36.8°C on July 14th (at Lindhult, Skaraborgs lan). With regard to precipitation also the year was highly variable. In general they were too low particularly spring was very dry. Southern Sweden received excessive rain in August and in the first half of September, quite often with heavy cloudburst and hail (Statens). All this information could be a source for climatic research, as the relatively low naval activities in the Baltic Proper since spring 1940 ended on June 22, 1941 . During the next couple of months the Kriegsmarine and the Baltic Fleets battled each other directly. However, this investigation continues to focus on the winter season, only modestly influenced by the sun directly. · October: A number of cyclones brought a lively variation to weather conditions with gale winds and rain particularly over the southern part of the country. A high-pressure area, arriving from the west drove strong northerly winds along the whole East coast. Low pressure over Norrland brought some mild westerly air and on its backside cold air up to gale forces in the Bottenhavet and the northern Baltic. On October 28th a strong cyclone arrived from NW over South Götaland and caused north-easterly snowstorms at the West coast. · November: The weather remained variable with strong winds or gales, along the whole Götaland coast from 12th–14th. Particularly severe was the gale in Skane, south and east coast (Trelleborg, Karlskrona), with wind forces about 11 Beaufort on 13th. From 16th – 22nd, high air pressure prevailed with permanent foggy and misty weather in South Sweden . Cyclonic activities continued for a short time from 26th–29th in the North, returning to dominant high pressure on the 30th. · December: From the 6th to the end of the month, with a few exceptions, the weather was dominated by passing cyclones sometimes with opposite wind directions (Norrland – easterly; Götaland –westerly), enormous weather variations and a ‘deep fall’ of temperature, up to 15 degrees in 24 hours. The low record for Sweden at Malgovisks school on December 13th has already been mentioned (E1, p. 127) On December 27th to 28th wind-forces of 10 and 11 Beaufort were registered at the West- and South coast. · January 1942: After a brief interruption by a small cyclone crossing southern Norrland, a very high air pressure center established itself over northern Scandinavia by January 13th and remained there until the end of the month, rising to levels never registered before. Temperatures fell to record lows, and under cloud covered skies, easterly winds reached –25° to –30°C on January 24th. Further details for January in the next section. · Februray 1942: Wind and snow hampered navigation and rail traffic. The difficulties reached their height in Skane on 12th. On 15-16 with mild winds, temperatures returned to positive figures in North Sweden, while there was severe cold in South Sweden . The air pressure had been higher than usual over the whole country. Deviations of 9-10mb in Norrland; in Skane 4mb. It is worth noting the remarkable difference of highest temperature values in 1880 compared with 1942, which demonstration again, that the Baltic was deprived of the common seasonal heat reserve in January and February 1942. · Spring 1942: In the southern Götaland and Gotland Island it was the coldest March since 1860. The sea ice conditions in Swedish coastal waters were severe and long lasting. Floating ice could be still observed off Malmö on May12th. That has not happened since such observations had started in 1870 (Liljequist, 1942). Comment: The enormous variation and erratic behaviour of the weather is a significant indication that the ‘underlying’ seas irritated the atmosphere and forced it to its unusual behaviour. Also the Swedish picture shows that the making of the Atlantic cyclone was still functioning in December, but that the continental air thrust through Middle Europe finally prevailed. Gösta Liljequist wrote the official Swedish sea ice report for winter 1941/42 (Liljequist, 1942). After the two hard winters of 1939/40 and 1940/41 and the difficulties they generated for the shipping and the fuel supply for the country, one has awaited and expected that the winter of 1941/42 would bring the return of mild winters, which had recently predominated. Instead this winter became one of the toughest, if not the severest of all winters during the last 200 years. As Liljequist was able to do research and to publish during the war, a number of references to his work have already been made previously (see, e.g. A2b, B(c); pp. 4 & 27). He observed that winter came up with three of the coldest months ever recorded in Stockholm (see Figure B-6, p. 27). On the other hand it remained a big amazement that he did not pick up any of the observed extremes to ask the simple question: why? The following overview is based on the official ‘Swedish Arsbook’ (SMHI, div) which offers ample material that should have raised the curiosity of climatologists since long ago. General Overview: During the first few days of the month a moderate westerly airflow dominated. On the 4th a high pressure zone developed in the NW of Lappland, which brought cold winds to the whole country. On the 7th a small low pressure area moved over Norrland to the East, where air pressure remained equally distributed but afterwards increased in general. On the 13th there was a high-pressure zone over northern Scandinavia . Wind came from an easterly direction in most parts of the country until the end of the month. The highest air pressure of 1045 mb was measured on the 21st in Norrland. Together with easterly winds snowfall occurred temporarily, particularly on the Baltic coast. On the 24th very cold air came from the East, despite of a cloudy sky, temperatures dropped down to -25°C and to -30°C, with a wind speed of more than 10 m/sec at the same time. On the 26th recorded temperatures were between -35°C and -40°C with a clear sky and calm as far south as Smaland. Especially, between the days 25-26 and 29-30 a great difference in air pressure was recorded between northern Sweden and the southern Baltic, with easterly winds (kultje) dominating temporarily at the Baltic. Air pressure: The mean value was higher than usual all over the country. The deviation in the northerly Norrland was the highest (17-18 mb), but decreased gradually towards the south, so that at Skane the deviation was still 4-5 mb. Never before was such a high mean air pressure recorded in January for Norrland. Usually the air pressure in Norrland is lower than in Götaland. Westerly and south-westerly winds usually dominate at that time. In January 1942 the situation was completely reversed, which caused permanent easterly or north-easterly winds. Temperatures: The biggest temperature deficit, about -10°C, was recorded in the interior parts of Götaland, northern Varmeland, Dalarna and southern Norrland. A number of record temperatures were recorded in Götaland and Svealand. The temperatures were 6 to 7°C lower than the lowest known temperatures until then. A depiction of the circumstances evidently demonstrates that the Baltic (and North Sea ) had lost their usual heat reserve. “An arctic air mass in the form of a closed upper low, had already advanced over Europe earlier; it had reached Finland on January 8 and on the 15th divided over Germany where one fork was driven to the North Sea on the south-west flank of a Scandinavian high pressure while another fork was caught by a central-Russian low pressure and remained there. On January 18 a smaller, independent cold air pool was formed over north-west Germany while the Russian dome, considerably reinforced on the arrival of another cold trough penetrating form the north-west then reaching out over Germany from across the Baltic. In a few days, however, it was pushed back eastward with the main mass. There it united with a low pushing westward from the interior of Siberia . This low reached the district of Moscow on the 23rd and on the day after the atmospheric space around Smolensk; on the day shown here ( Fig. 1; Weather map of Jan. 25 1942) it was still perceptible above the Baltic. This surface low was accompanied, in the free atmosphere, by unusually low temperatures and a corresponding upper cyclone. When, the night before, it passed Riga , the lowest temperatures were measured up to date above the European atmospheric space and these were recorded in several layers. It may be mentioned, further, that the average temperature of the 1000-500mb layer was lower than that corresponding to the January average at the cold pole, which best illustrates the unusual intensity of this cold air pool”. The question should have been: Did naval warfare bomb the “North Pole” into the Baltic region? 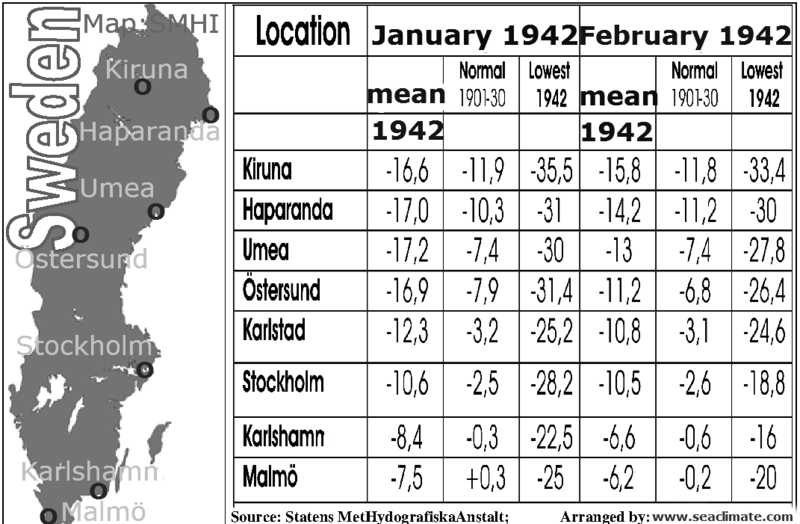 Didn’t the SMHA-Arsbok (1942) note that over northern Sweden (Norrland) never before had such a high mean air pressure been observed as during January 1942. That seemed to have contributed to windy conditions from north-east over Finland since the 24th that grew stronger, reaching its maximum on January 26 when wind speed increased to 9 Beaufort. On the same day in Småland/Sweden the sky was clear, no wind, and temperatures between –35° and -40°C. Extreme differences over short distances. It seems a lot of research needs to be done on one cold air pool. · The fact that the deviation from the lowest mean temperature was significantly severe in the middle and southern parts of Sweden . · The ‘highest monthly temperatures’ were far lower than in 1880. The difference of about 7°C in January and February (Fig. E4-3), is a clear indication that the Baltic had ‘cooled out’ very early so that the sea could hardly supply the atmosphere with any energy. The high air pressure in Norrland is certainly worth noting as well as the change of position, of higher/lower air pressure with Gotaland. The reason for this to happen was anthropogenic. The military combat between German and Russian naval forces, in the Baltic for over five months in autumn 1941, and naval warfare further west, shifted the course of the Baltic climate and gave Sweden and Stockholm an ice-age type winter. 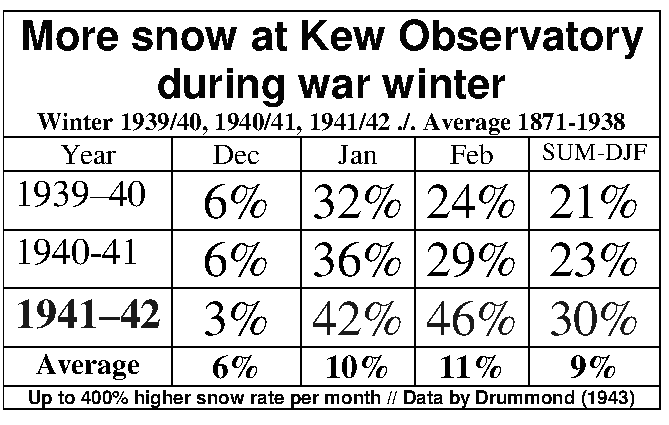 In The Netherlands winter 1941/42 (rank 3) was colder than 1939/40 (Rank 8) during the period of observation from 1706 to 1946 (Labrijn, 1946). T.A.Harley , “The British Weather”, at http://www.personal.dundee.ac.uk/~taharley/britweather_years.htm ; visited March 30 2011. All information in this section is based on the Witterungsbericht, 1948. The full excerpt is taken from E. Palosuo (Palosuo, 1953, p. 37), naming as reference: Scherhag, Richard, 1948: “Neue Methoden der Wetteranalyse und Wetterprognose”, Berlin .